If you’re a business owner, it’s extremely important to keep on top of your social media game. 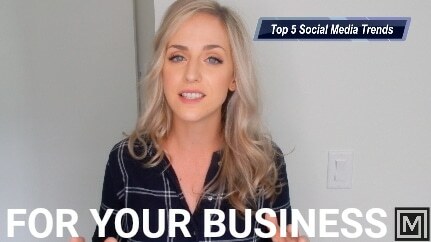 Let’s discuss the Top 5 Social Media Trends you should be using! Facebook live allows fans to get to know the brand better, to form relationships, and interact on a new level that wasn’t previously possible. Before Facebook Live, fans were only able to comment on recent posts. With this new level of interactive, real-time engagement, engagement on Facebook itself has seen a dramatic increase. Unlike other live video streaming (such as Instagram), FB Live allows you to automatically publish as a video afterward. If this isn’t enough for you to join the Facebook bandwagon, it might be helpful to understand that users are 3-10 times more likely to comment on a Facebook Live video than on a video that isn’t live. What to take from this: Consider using Facebook Live as a tool to communicate with your fans on a weekly or daily level, whatever you prefer. This is a great opportunity for Q&A sessions! Snapchat is heating things up and making it easier than ever for you to keep up! You are now able to see what the hottest topics are in your area (and around the world) by viewing a heat map that displays the hottest spots, or in other words, where everyone is Snapchat-ing. Using this incredible tool can help businesses manage their social media time by only using Snapchat as important events pop up. What to take from this: Consider using Snapchat only during promotional events and special occasions to show up as a “hot” spot in your area and not a business what spams their clients/customers. Instagram has recently changed its algorithm to be more authentic! Now the posts that followers “like” and communicate with the most are showing up before others. Another important aspect to this algorithm is keeping on top of your consistency- posting frequently enough to maintain adequate communication with your following, yet not spamming them. The use of micro-influencers is no secret, one of the BIGGEST secrets to success. Brands typically want to partner with social influencers who have thousands, if not millions, of followers- which is understandable. However, what they’re missing are the cold, hard facts. It’s a common misconception that bigger followings are better- but micro (or smaller) influencers are more relatable and almost always have a deeper, personal relationship with their following. Smaller influencers are able to respond to their following quickly and frequently, with their following viewing them more as friends more than celebrities.When micro-influencers promote a business, they are often trusted and seen as more authentic by their audience. What to take from this: Keep in mind that micro-influencers are a great option to promote your business, and they often provide very affordable options. Posts that a user follows and actually interacts with will be seen FIRST- before all of the others. Instagram is also implementing a new policy to require influencers to be transparent in their partnerships by displaying Paid-Partnerships tags- tags that clearly disclose that they are sponsored and by what company. This both benefits the influencer by showing transparency, and the business who gets direct links to their accounts. What to take from this: Using micro-influencers and paid-partnership tags can show transparency in your business while getting an increase in targeted traffic right away. Twitter has recently changed their layout to be more multi-platform (or, what I like to call, mobile) friendly. They provided new icons that allow interactions to be easier than ever- with the click of a button- which is proving to be beneficial in increasing engagement from followers on all Twitter accounts. What to take from this: Use Twitter to communicate with your audience and experiment with a new CTA (Call To Action)! Now get out there and use these 5 social media trends to your advantage! Need help understanding common internet marketing acronyms? Visit last week’s blog!